The Britax Traveller Plus has been designed for children with special needs. Its design features have been developed to provide maximum protection and comfort for your child, whilst being practical and easy for parents to use. The hard, exterior shell and 5-point safety harness provide optimum side impact protection. The Britax Traveller Plus has removable foam pads and rolls for extra support and comfort when and where required. 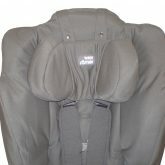 The adjustable foam head support cradles the head of your child, maintaining posture. In addition, the body of the car seat has superior padding so your child is provided with optimum comfort when in the car. The clip between chest pads prevents your child removing their arms from the harness so you can be reassured that they are always safely secured in the car. 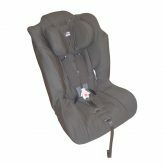 The crotch strap and head support are both adjustable and so the car seat caters for children of all different sizes. The cover of the car seat is removable and machine washable so it is easy to keep clean. The Britax Traveller Plus Special Needs Car Seat is suitable for children from 4 years to 11 years (approximately 15kg – 36kg).